Gettysburg Licensed Battlefield Guide Rich Bellamy is standing on East McPherson’s Ridge near the monument for the 76th New York Infantry Regiment. The monument was dedicated on July 1, 1888. Sheads Woods on Seminary Ridge are in the background. This view was taken facing east at approximately 5:30 PM on Thursday, May 13, 2010. Gettysburg Licensed Battlefield Guide Rich Bellamy is the host for our series on Cutler’s Brigade of the United States’ Army of the Potomac. To contact Rich by e-mail, please click here to reveal his email address. In our first Cutler’s Brigade post Gettysburg Licensed Battlefield Guide Rich Bellamy provided background on division commander Brigadier General James Wadsworth, the 104th New York Infantry Regiment, and the brigade commander, Brigadier General Lysander Cutler. In today’s Cutler’s Brigade post Gettysburg Licensed Battlefield Guide Rich Bellamy discusses three regiments in Cutler’s Brigade, the 76th, 84th, and 147th New York Infantry regiments. This map shows the location of the videos for Cutler’s Brigade posts. Video #1 was taken near the statue of Brigadier General James Wadsworth. Video #2 was taken at the monument to the 104th New York Infantry Regiment. Videos #3 and #4 were taken at the Cutler Brigade plaque on Reynolds Avenue. Video #5 was taken at the monument to the 76th New York Infantry Regiment. Video #6 was taken near the railroad cut. Video #7 was taken near the monument to the 147th New York Infantry Regiment. 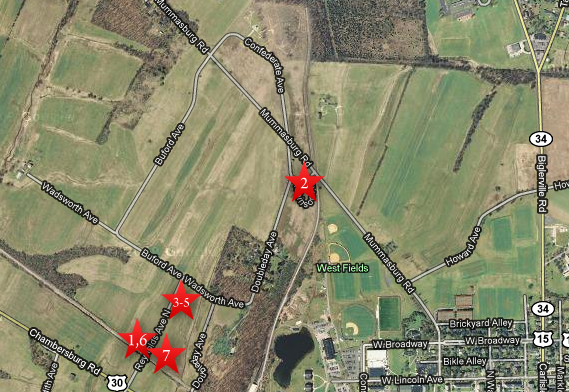 This map was created facing north at approximately 5:30 PM on Monday, May 17, 2010. 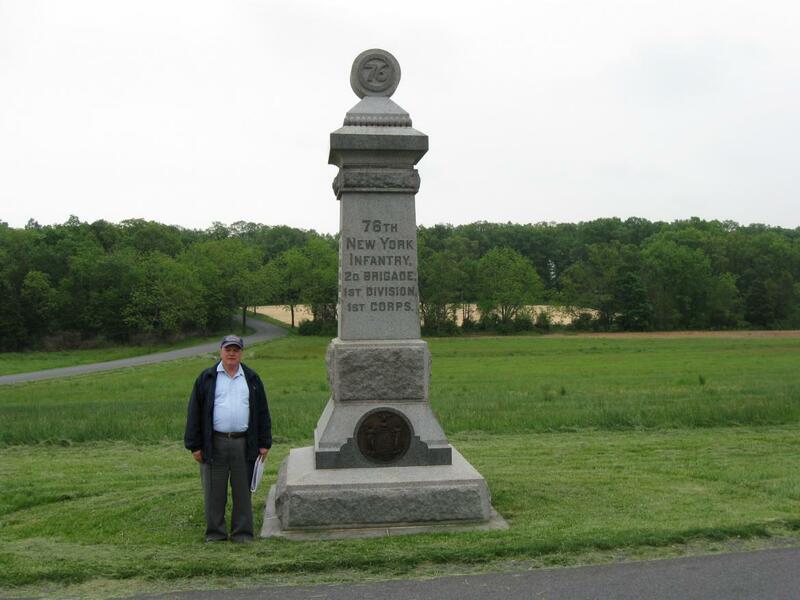 In Video #5 (Videos #1-#4 were shown in our previous Cutler’s Brigade post) Gettysburg Licensed Battlefield Guide Rich Bellamy is standing on East McPherson’s Ridge near the monument to the 76th New York Infantry Regiment. He discusses the death of Major Andrew Jackson Grover, and the removal of the first commander of the 76th New York, Colonel Nelson W. Green. This view was taken facing southeast at approximately 5:30 PM on Thursday, May 13, 2010. 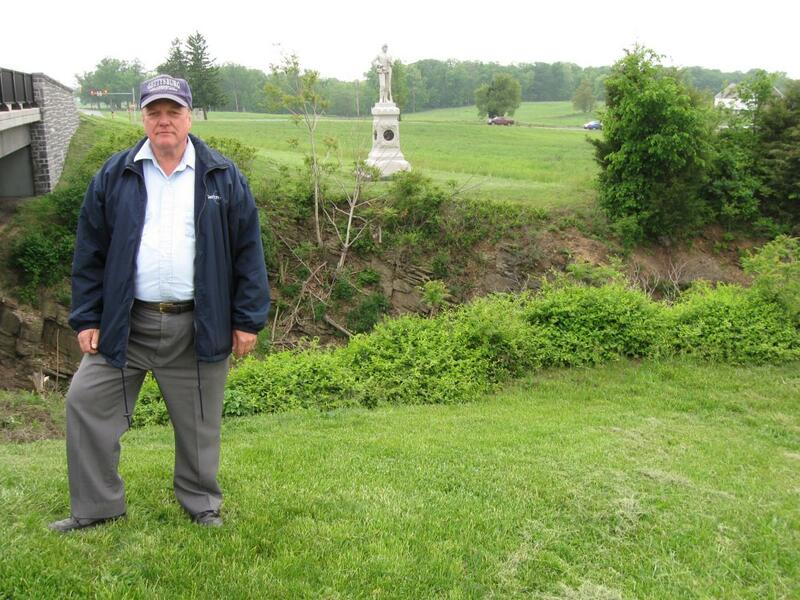 Licensed Battlefield Guide Rich Bellamy is standing on East McPherson’s Ridge by what was in 1863, railroad cut. The bridge on the left carries North Reynolds Avenue after the railroad cut. The monument to the 14th Brooklyn/84th New York Infantry Regiment is in the background. The white building in the right background is the McPherson Barn. This view was taken facing southwest at approximately 5:30 PM on Thursday, May 13, 2010. In Video #6, Licensed Battlefield Guide Rich Bellamy is near the East McPherson’s Ridge railroad cut. He discusses the numerical designation of the 14th Brooklyn/84th New York and their Gettysburg commander, Colonel Edward B. Fowler. This view was taken facing southwest at approximately 5:30 PM on Thursday, May 13, 2010. A closer view of the east side of the monument to the 14th Brooklyn/84th New York Infantry Regiment. The monument was dedicated on October 19, 1887 at a cost of $3510. McPherson’s Woods/Reynolds’ Woods/Herbst’s Woods is in the background. 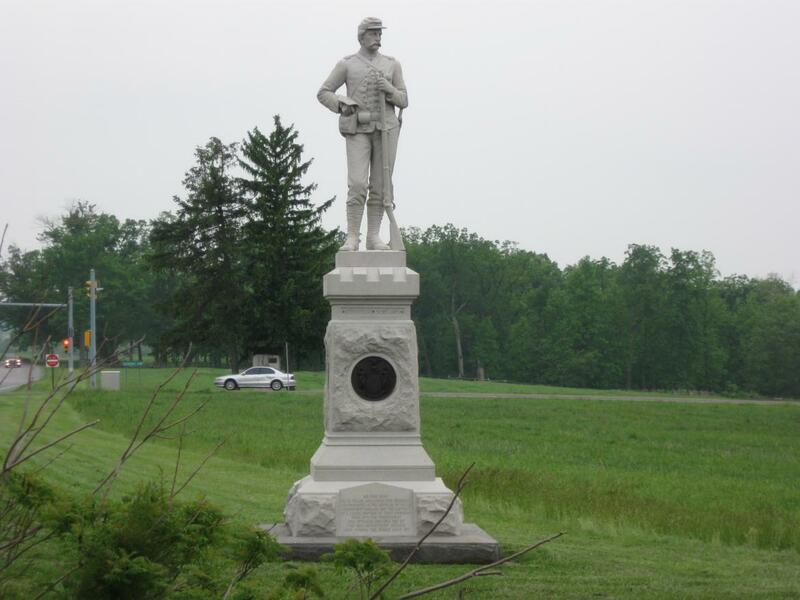 The car in the background is stopped in front of the monument to the 143rd Pennsylvania Infantry Regiment. This view was taken facing southwest at approximately 5:30 PM on Thursday, May 13, 2010. 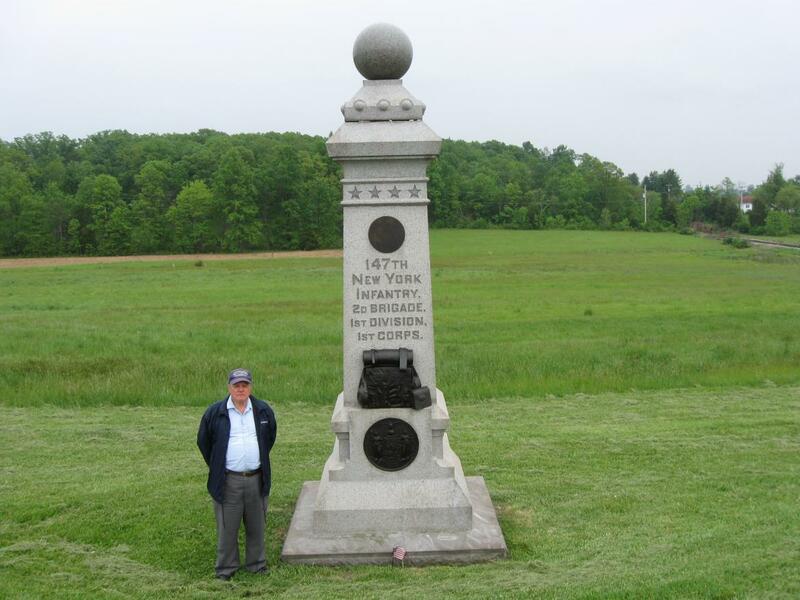 Rich Bellamy is standing on East McPherson’s Ridge near the monument the 147th New York Infantry Regiment. The monument was dedicated on July 1, 1888 (same day as the 76th New York Monument). Sheads Woods/Railroad Woods on Seminary Ridge are in the background. The railroad tracks are visible in the right background. This view was taken facing southeast at approximately 5:30 PM on Thursday, May 13, 2010. In Video #7 Rich Bellamy is standing on East McPherson’s Ridge near the monument to the 147th New York Infantry Regiment. He provides some background of the regiment and of their Lieutenant Colonel, Francis C. Miller. This view was taken facing southeast at approximately 5:30 PM on Thursday, May 13, 2010.